One of the key findings about How People Learn is that teachers need to draw out and work with students’ existing knowledge and skills. Ken Bain, in What the Best College Teachers Do, emphasizes students need to encounter a safe environment to try, fail, get feedback, and try again before facing a summative evaluation. The challenge for instructors is to find ways to draw out knowledge from EVERY student and create opportunities for EVERY student to practice. 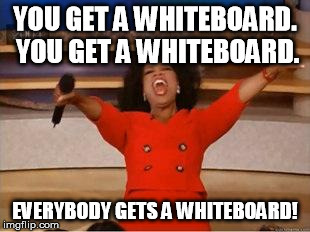 Small, portable whiteboards (aka dry erase boards if you’re searching your institution’s suppliers’ catalogs) can achieve both of these. Size and weight are the biggest concerns. Oh, and cost. You can cut way down on weight by foregoing magnetic whiteboards. We found these 18″ x 24″ light-weight whiteboards by Universal available through CDW. They’re only $15.99 retail (and even cheaper through our institutions purchasing system). These boards are so light, it’s very easy for students to pass them around, rest them on their knees, and hold them up for others to see. The only drawback to these particular boards is an inch-wide pen “tray” along the bottom of the board — the boards are made to be mounted on the wall — but it makes a good handle for students to grab. To create opportunities for EVERY student, it’s important to have enough dry erase markers that EVERY student gets one. Otherwise, he who holds the marker, holds the final say. I also like to give each student a different colored pen so they (and I) can easily see their contributions. We went with EXPO fine tip dry erase markers that come in boxes of 12 for $23.92 at Grainger. Four boxes – black, blue, red, green – gave us four markers for each board. We also included an eraser in each kit ($3.99 each by Universal from CDW) and a container of EXPO cleaning wipes ($14.99 at Grainger) we use to give the boards a once-over every now and then. You can’t waste a lot of time handing out pens and erasers, collecting them again at the end of class so we put each set of 4 markers and an eraser into a pencil case, one per board. This works beautifully – quick to distribute, quick to collect, quick to reset for the next class. We found these canvas + mesh (mesh was great because you see what was in the kit without having to open the zipper) at our university bookstore for $2.29 each. University instructors very rarely have a classroom where they can leave things. Instead, you arrive at the classroom 5-10 minutes before your class starts, bringing everything you need – computer, video adapter thingy, notes, water bottle, hand-outs, WHITEBOARDS – and then carry it all away after class. So, portability of these whiteboards is a critical. We totally lucked out searching our universities suppliers’ website for “carrying case” when we stumbled onto this carrying case made for a retractable TeleSteps ladder ($74.90 from Grainger.) The bag easily holds twelve 18″ x 24″ whiteboards, with enough room to toss in the pencil cases. I’m not saying the strap doesn’t dig into your shoulder after walking halfway across campus but the case keeps everything in one place and you can dump on the ground when you get to class and deal it once you’ve got everything else ready. Heck, ask one of those enthusiastic students in the front row to distribute the boards and pencil cases for you. There’s taxes and delivery. And prices will vary if you buy these directly from the supplier or through your university’s purchasing website. You’ll have to keep buying more markers and cleaning wipes but everything else is a one-time purchase.